The beach is supposed to be a refuge for the children of Gaza. Now it is the scene of a war crime. When the Palestinian national soccer team secured entry into the 2015 Asia Cup, winning the right to play in an international tournament for the first time in its eighty-six-year history, crowds gathered by the hundreds to dance, play music and watch the triumph of their national team on large movie-sized television screens on the beaches on Gaza. The oceanfront represents the illusion of freedom for a land otherwise encircled by walls and checkpoints. People often gather on the beach to celebrate because it is a refuge from densely populated squalor that defines so much of an area that they have been compelled to call home. This is especially the case for children. The Bakr boys were killed in an area they believed to be safe. Mohamed’s mother, grieving at the hospital, was quoted by CNN as saying, “Why did he go to the beach and play—for them to take him away from me?” Several reporters on hand were shocked at what happened. 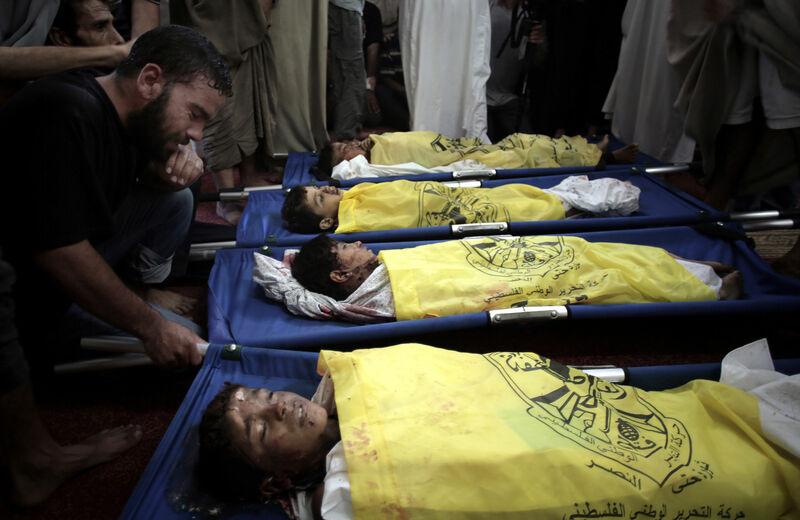 Ayman Mohyeldin of NBC, tweeted: “4 Palestinian kids killed in a single Israeli airstrike. Minutes before they were killed by our hotel, I was kicking a ball with them #gaza.” After this, Mohyeldin was taken off the air, and was only allowed to return following an online campaign launched to defend him. The reasons behind NBC's decision to pull him and then return Mohyeldin to Gaza are still very much in depute. Whatever the cause, Mohyeldin was doing the kind of journalism that forced people to see Palestinians as actual human beings.